It’s finally getting chilly here in Florida! It’s snowing everywhere north of here, but it’s chilly here in Florida! I miss the snow, so we’ve been planning on where to go to see the snow soon. Even though it’s not snowing, and some people will roll their eyes at us if I comment on how I had to turn the heat on, I still want some comfort soup. Lately I’ve been a little embarrassed with my food choices being four months pregnant. The other day I just really wanted Zuppa Toscana from Olive Garden. That night we went out again, and I ordered more soup. 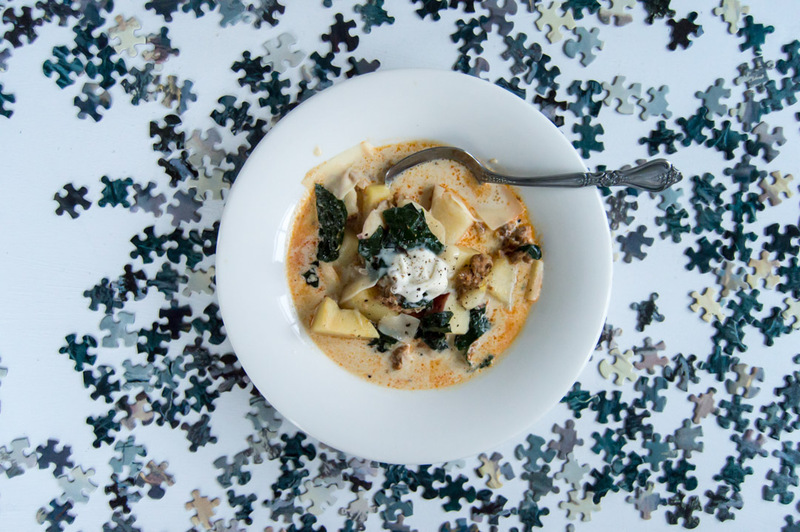 The weather just calls for soup! Side question- if you’re pregnant, do you find yourself wanting to go out to eat more often because you just don’t know what you’ll want to eat? I feel like we’re spending so much extra money on going out to eat because I just am not in the mood for anything until my mind is made up when I’m actually hungry. After eating soup for a couple of meals, I decided that it was safe to probably make soup at home. Even if my mood changes, at least I know the gentleband will appreciate it for lunch this week. 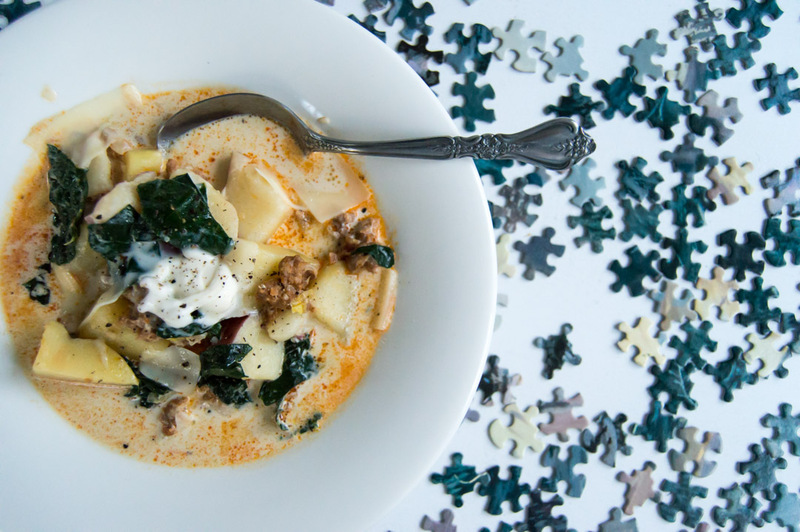 I didn’t want to call this a copy cat Zuppa Toscana soup because I made a few changes. That’s the greatest part of cooking; you can really make any preference changes. So feel free to change this recipe. 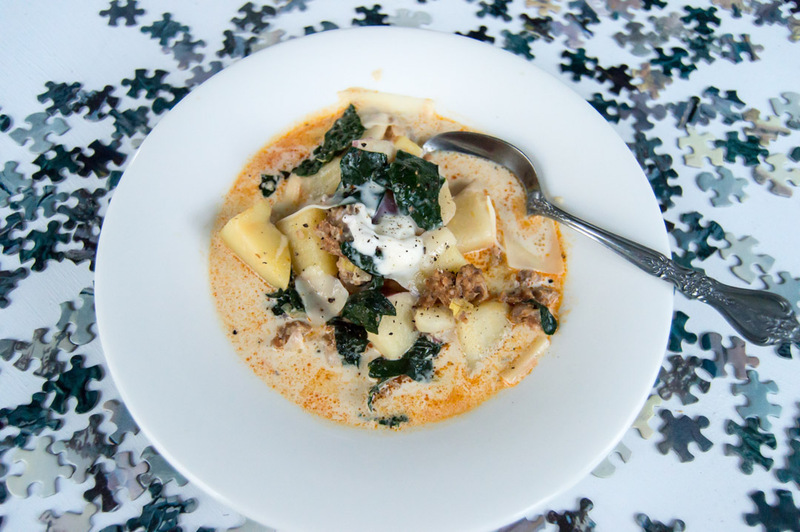 There’s also a ton of recipes out there for Zuppa Toscana, so there’s already so many variations! This is probably one of the simplest recipes I’ll ever share. Sometimes I think these recipes are silly to write because of their simplicity, but sometimes you just need it. You need something delicious that’s easy to throw together during the week or you just need some inspiration. I love this time of year! Not only does the colder weather give me a better attitude, but the holidays we celebrate are so endearing! My gentleband and I have been trying to do a puzzle together this time of year as a tradition. The funny thing is, in the past I accidentally kept buying super easy puzzles, and we’d complete them in a day. This year I was very purposeful on getting a challenging puzzle. It has been quite the challenge for us, but we’re going places. It’s taken up our dining room table, and I’m not going to forsake our work so hence all the puzzle pieces. ∙Bring to a simmer, and at this point you can add in your salt and pepper. I thought our sausage was pretty salty, so I opted out on the salt and just did a generous amount of fresh cracked pepper. ∙That’s it! I topped my bowl of soup with parmesan, crème fraîche, and some more pepper! Crazy how easy, right? Like I said, there’s a ton of copy cat recipes out there that all have been altered, so feel free to change anything or make it exactly like this!